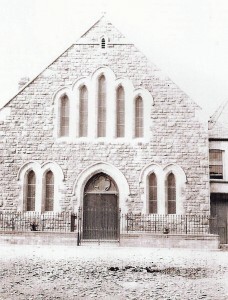 “…KILGERRAN CHAPEL. SIR,—I have read the correspondence which has been in your paper on the subject of the Kilgerran Cbapel which I infer that the writers on both sides insinuate that the late Mrs. Margaret Harris, of Fishguard, in 1803, executed the lease to my respected father, with a goodly knowledge of its rottenness. This I can not believe. 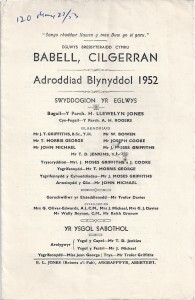 That lady was an exemplary Christian, and a member all her days of the Welsh Methodist connexion, I am, Sir, yours respectfully GEORGE BOWEN, Llwyngwair, January 1st, I851. In 1851 “Tabernacle” had 106 attendees and 85 scholars in the mornings and 180 in the evening, overseen by the steward, Ebenezer Bowen. In 1862 Rev. Thomas John died. In March 1912 Rev. 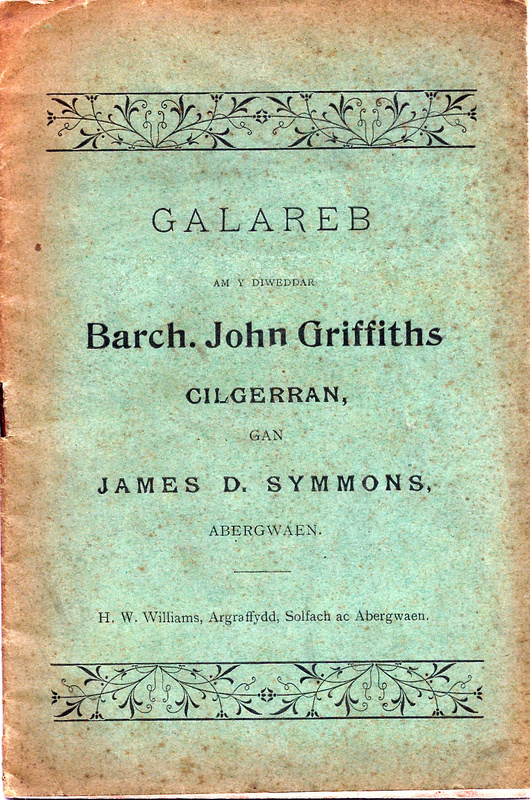 Arthur Henry Rogers of Aberystwyth, a native of Llangefni, Anglesey, accepted the call to Cilgerran. On 26th & 27th August 1912 his induction took place. In 1912-21 Rev. Arthur Henry Rogers (b. 1880) was the Pastor. On 5th March 1913 Rev. Arthur Henry Rogers, Minister, married Miss Annie Griffiths of Tyllwyd, Cilgerran, the daughter of his predecessor – the late Rev. John Griffiths. The chapel’s 1913 outing was to Poppit, St. Dogmaels. In September 1915 the following new Deacons were elected: Stephen George, Penuel Cottage; Thomas Michael, Castle View; David Davies, Dolbadau; J. Oliver Jones, Tymelyn; Mr. Lodwig, Glanpwllafon, St. Dogmaels; and Mr. Griffiths, Glasfryn. On 23rd May 1920 a new organ was installed. In February 1921 Rev. A. H. Rogers announced his intention to leave for Elim, Tirydail, Ammanford. Rev. Arthur Henry Rogers returned in February 1926 and was Minister again until 1951. In September 1927 Thomas Michael, plasterer, died. He had been the secretary of the chapel for 26 years. In August 1932 and July 1933 the chapel house was advertised to let – the tenant to act as chapel caretaker. At the end of December 1950 Rev. Arthur Henry Rogers retired as the Minister after more than 33 years, giving his last regular service in May 1951. In September 1952 Rev. Huw Llewelyn Jones became the Minister, having succeeded Rev. A. H. Rogers. His induction took place on 16th & 17th September 1952. The Deacons that year were J. T. Griffiths, W. Bowen, T. Morris George, Joseph Cooke, John Michael and Moses Griffiths. There were 112 members that year. In April 1957 Deacon Johnny Michael died. In 1957 Rev. Huw Llewelyn Jones left for Ystalafere. On 2nd & 3rd September 1958 Rev. J. Rees Hughes was inducted as the new Minister. In 1961 Rev. 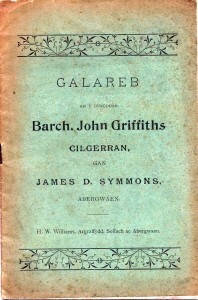 J. Rees Hughes left for Blaengarw. On 25th September 1965 Rev. 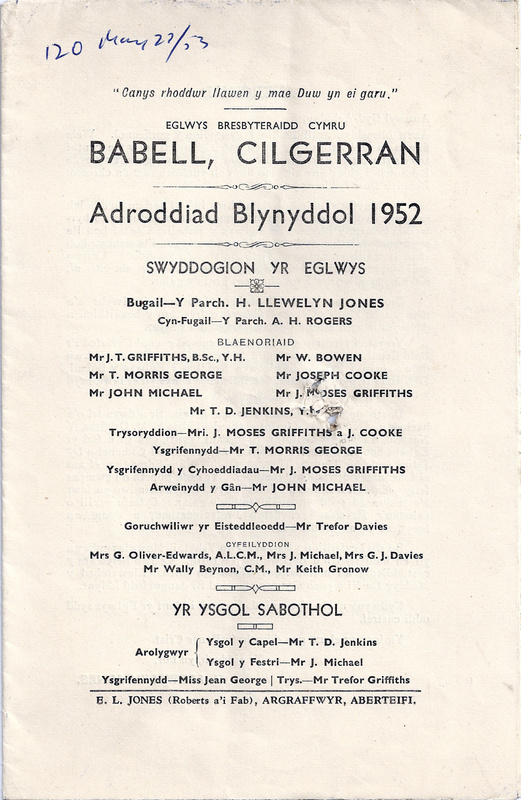 Gomer M. Roberts (1904-93) – Minister of Glanrhyd Chapel, Llantood, was inducted as the new Minister. He retired in 1969. In 1969-78 Rev. D. Leslie Jones was the Minister, after the retirement of Rev. Gomer M. Roberts. In 1978 Rev. Leslie Jones moved to Pontardulais. In 1978-2005 Rev. Richard Williams was the Minister. In February 1996 the vestry was offered for sale. 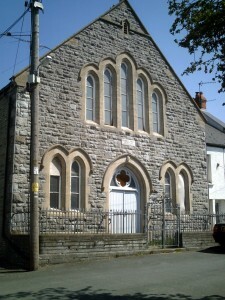 On 14th December 1997 a concert was held here to celebrate the bicentenary of the cause at Cilgerran. In 1999 Mrs. Megan Davies was acknowledged for her seventy years as chapel organist with a special service in her honour. On Tuesday 8th February 2011 the chapel closed. Gable-fronted Calvinistic Methodist Chapel of 1891 in rock-faced stone with angle quoins. Pitched slate roof with decorative terracotta ridge tiles. Façade has 2 storeys. Central paired timber doors with arched overlight containing quatrefoil tracery, within sandstone surround and raised hood. Outer bays have paired 3-pane lights, tall with sandstone dressings and dividing piers, paired sandstone hoods. Gable has central 5-light window of similar narrow lights, graded to higher centre, all with linked hoods and with sandstone dressings and dividing piers. To apex of gable is raised sandstone band broken by small arched headed ventilation opening. Small finial to coped gable. Interior (2011) has 3-sided gallery on cast iron columns (made in Cardigan) with diagonal slatted timber panels. Pitch pine pews, gallery and pulpit. 3-sided pulpit ornately carved. Arched pulpit back in raised stucco. Tom Mathias, John Williams-Davies 1995. Y Corwg No. 4, 1999. Sadly the Chapel is not listed and will be at the mercy of any developer who buys it !